In the face of aggressive Russification policies, spiritual specialists in southern Siberia are seeking to strengthen the cultural and social relations that constitute indigenous personhood. Based on fieldwork in the Republic of Altai, Russian Federation (2002-), this paper suggests that Altaian shaman and epic-teller Arzhan KÃ¶zÃ¶rÃ¶kov (1978-2012) healed his clients by creating two interrelated dimensions of â€˜placeâ€™. The first was a place of power and transformation in local landscape from which connections to other dimensions were made during ritual performance. The second – once a means of cure had been established â€“ was a sense of â€˜being-in-placeâ€™ within cosmic and local landscapes and contemporary society. Essential to this process were the sonic â€˜pathwaysâ€™ created by the shaman to link the strategically-situated ritual sites within a performance arena, ritually mapped by the shaman and clientsâ€™ bodily movements, to different levels of the universe and to the site of the clientâ€™s problem. To accomplish this, he used a range of vocal, instrumental and vibrational movements and sounds (including the guttural harmonic-laden kai throat- or overtone-singing central to Altaian sound culture) that activated his extra-sensory perceptions. Along these pathways travelled sonic communications, spirit-actors (including ancestors and heroes) and the shaman himself. Surrounded by a circle of protective spirits, in a sensual powerful place, the shaman identified the human or spirit-human rupture in social relations that had led to the clientâ€™s problems (e.g. terminal illness, alcoholism, infertility and bullying), opened the necessary pathways for healing, incorporated circular bodily movements to encourage renewal, and re-situated the client within a strengthened network of traditionally understood indigenous relations. The bhume or sakela ritual among the Rai of Eastern Nepal is a seasonal agricultural festival, in which the deities of the land are given offerings by a local shaman and his or her assistants at specially designated places. For those participants without ritual function, the social aspect of the ritual is expressed and embodied in a circular collective dance, which in former times was only performed around the spots of worship themselves. Today, however, a dance circle can be opened at any place, and can be transformed into a ritual space on the spot by sticking a symbolic axis mundi into its center and placing a small offering. In this way, the ritual space appropriated though the collective dance circle is a mobile one in two ways: It is a space in motion through the movements of the dancers themselves, and it can theoretically be opened in any thinkable locality. This is applied in practice among the Rai in many diaspora contexts for the bhume festival worldwide, but also to transfer the ritual space out of its original context and re-implement it for instance in dance competitions or on stage outside the ritual season. 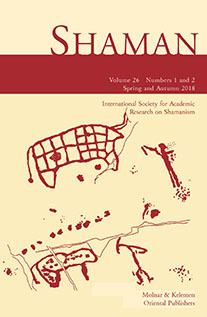 Based on the example of the sakela dance, and with references to other rituals of the Rai, this paper discusses the concept of mobile ritual space in the shamanic societies of Eastern Nepal and its implications for their globalized diasporas, and in the contemporary Rai society within a transforming Nepali state. Some Hypotheses about Shamanic Elements in the Teyyam Ritual of Kerala: Is the Lost Nymph a Shaman? My paper focuses on some hypotheses about a feminine ritual dance of Kerala (South India), the Devakooth, performed every two years in several sacred spaces on and around Tekkumbad, a little island along the coast. Considered a form of Teyyam, a group of trance-possession spectacular ritual dances executed only by males, the Devakooth, the only feminine Teyyam is supposed, nevertheless, to be a non-possession performance showing the return to heaven of a nymph that got lost on earth. During my fieldwork projects I have been concerned with Teyyam as an unusual form of shamanism, seeking for traces that could support my supposition, and trying to explore the social and performative spaces where dancers interact between visible and invisible worlds. The Teyyam is performed by some trained persons from specific families of ex-untouchables castes, and it shows, in some way, characteristics that are possible to observe in the so-called shamanic traditions. In the meantime this complex group of performances and performers is far away from being considered a form of shamanism. A possession state of the performer is presented as one of the turning-points of the performance. At the same time there is only one woman who practices a form of Teyyam, the Devakooth, but itâ€™s a form of being without possession. During fieldwork between 2009 and 2014 I have tried to develop some metaphors (para-shamanism, meta-shamanism) to work on this problem, as I would like to consider Teyyam as a form of shamanism. My hypothesis, and the kernel point of my paper, will be that a deeper, if possible, inner and lived (at the moment no westerner has accessed Teyyam performance as a performer) experience of this performance, will enrich the collective discussion about the supposed borders that define actions and rituals in shamanism and performance studies. My paper focuses upon particular peoples at a particular moment of crisis: enslaved African Americans and embattled southeastern (US) Indians during the years surrounding the British/US War of 1812. What emerged through these moments of crisis were systems of polyrhythmic bodily-shaking and counter-clockwise ring dance that sustained countercultures of local authority and resistance (praise houses of the Gullah church, the stomp dance cultures of Seminole, Creek, and Choctaw peoples). Some of these means of reassembling sacred societies and landscapes in a broken time (of enslavement and removal of folk from their lands) migrated across the Caribbean when British-allied refugees of these wars resettled in Trinidad and Jamaica where ring-shouting/shaking traditions soon arose (Spiritual Baptists, Zion Baptists). I seek to show how these Afro-creole/Amerindian shamanic complexes reassembled at a time of intense struggle to foster vibrant countercultures of the sacred in the face of violent opposition. I am also interested in how 21st century artist-activists from these shamanic complexes (Amerindians like LeAnne Howe and Joy Harjo, Afro-creoles like Erna Brodber and Earl Lovelace) engage these 19th-century cultures of resistance to shore up sacred landscapes and possessions of our own time. These cultures of what Bradford Keeney calls â€œmedicinal shakingâ€ have practiced oracular rites of initiation, trance-dancing, and the building of altars and sacred landscapes that take on political import in communities challenged by real estate speculation, global standardization, and the displacement of communities from homes of long eco-systemic witness. The problem of transformation of the different cultural phenomena under unfavorable circumstances is one of the most provocative issues, because it really reveals mechanisms of adaptation of culture to such circumstances. Until what point can a cultural phenomenon be changed without losing its essential features which allow it to remain the same phenomenon, despite very strong transformation? In the case of Siberian shamanism we have the possibility to examine this issue in many aspects â€“ from art to politics, from the material to the spiritual, from collective to individual, etc. Our research of shamanic traditions in South Siberia allows us to demonstrate some of the mechanisms of such adaptation. The main focus of the paper will be the â€œmaterialâ€ side of the musical shamanic heritage of the Turkic peoples of South, Western and Eastern Siberia (the Altais, the Chulyms, the Khakasses, the Shors, the Tofas, the Tuvas). On the basis of analysis of many sources (Anokhin, Potapov, Dioszegi, Alexeev, Lâ€™vova, Sychenko, Arbachakova, Funk, Kharitonova and others) the author will try to demonstrate how the shamanic drum â€“ the vehicle, weapon and source or shamanâ€™s power â€“ was replaced by other sound instruments and non-sound tools. Which roles and functions of the drum were kept, which ones were lost, how were they connected with shamanâ€™s power and how this process allowed (and still allows) authentic shamanic tradition to continue â€“ all these questions will be discussed in the paper. Since a long time Tuvans have been familiar with the medicinal effects of music Itâ€™s hard to say which religion was stronger. So the shaman as representative of animist religion, an ancient priest, treated people with the melodic ringing sounds of khÃ¶Ã¶mei and the jaw harp khomus, which was called aza dyly – â€œdevilâ€™s tongue.â€ The Tuvan word for shaman comes from the Turkic word â€œkam,â€ in Tuvan kham, â€œkhamnaarâ€ literally means to perform a shamanic ritual. There is no agreement among scholars about the nature of shamanic music, and the definition of this phenomenon varies greatly among researchers. Most frequently the shaman appears as an incarnation of supernatural forces. The essence of the authorâ€™s approach to this research can be seen in the following way. The purpose of the shamanic ritual is a mystical communication with the spirit world. Therefore the state of Tuvan culture in the 70s and 80s required an urgent recording of the traditional culture of the last pure examples of the shamanic cult. The interest in this phenomenon is connected on the one hand with the peopleâ€™s everyday problems. For example, recently, archaeologists from St. Petersburg doscovered a massive quantity of golden works from the Scythian era of Tuva in the Valley of the Kings at Arzhaan I and II, as well as the â€œgolden queenâ€ found at the kurgan in Altai by archaeologists from Novosibirsk. Because of this, disasters began to happen – earthquakes and floods. The local inhabitants are constantly suffering. Folk wisdom says that in order to live a long and healthy life, people should not do harm to nature, cut down trees, or dig holes in sacred places. It was considered that master-spirits of the land lived in large larch trees, in birch trees, and in the high places of the mountains and taiga. This caused the urgent request to return the â€œgolden queenâ€ to the places where the digs had occurred, in order to calm the master-spirit of the place. As a result, the â€œgolden queenâ€ was returned from the Novosibirsk museum to her burial ground.